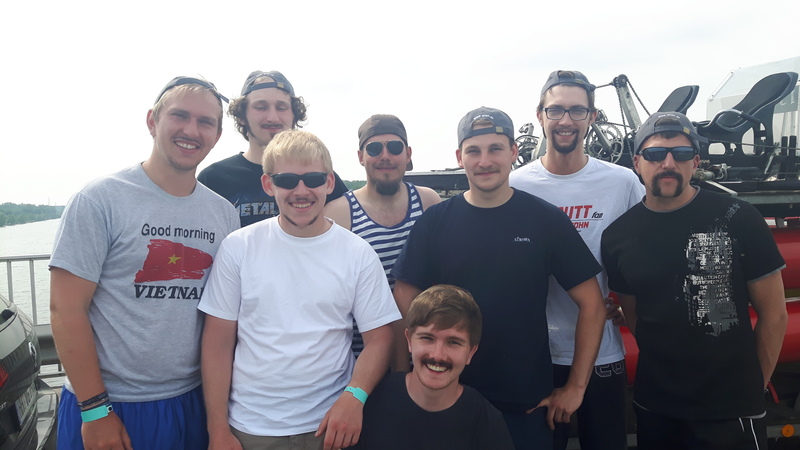 In 1987 in the most northern city of Germany – Flensburg – the seafarer students of the HS Flensburg founded the Tretboot AG. The University of Applied since in Flensburg is very close to the Flensburger Förde. Until now we build 6 boats, one of them (the „Flying Magic“) was able to fly and is now located in the German museum in Munich. 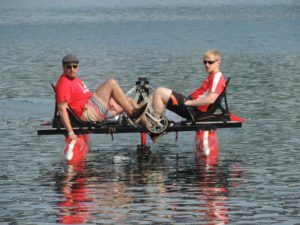 It was the first flying waterbike for two persons. Today the members for the Tretboot AG are from all departments of the FH and owner for 3 boats. 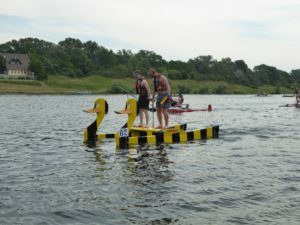 The „5 vor 12“, the „Fhuntastic“ and the „Tigerduck“. 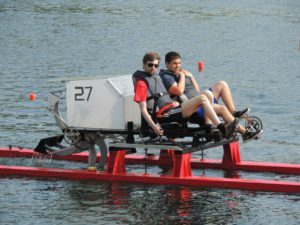 These three boats are all equipped with different propulsion. The „5 vor 12“ have a paddle wheel, the „Fhuntastic“ have a 360° rotateable pod drive and the „Tigerduck“ have a propulsion that empathise a fin of whale. As hometown of the delicious beer Flensburger Pils our best discipline is until now the „Secret Mission“. If you like to join us, visit us on Facebook, Stud-IP or write us an E-Mail. During the lecture period we meet every Monday from 18:30 in the „Tretboothalle“, Kielseng 15a, to the left of the sewage treatment plant.